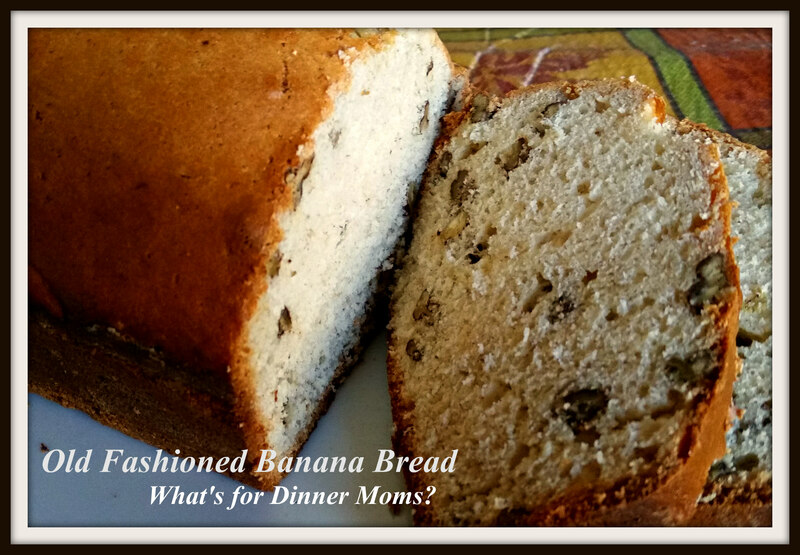 Old Fashioned Banana Bread – What's for Dinner Moms? Growing up we had a few cookbooks. One which I remember clearly to this day is the 1972 Betty Crocker’s Cookbook. This is the cookbook that I learned to bake from. If we wanted cakes or cookies growing up we baked them from scratch. Whenever I mention this cookbook everyone says, “We had that too!” I don’t think kids today will have the memories of Mom’s cookbooks. It will be Mom’s Pinterest account they remember. I collect older cookbooks so my kids are very familiar with recipe cards and old-fashioned directions such as cream the butter and sugar together. I hope they love them some day as much as I do. I make homemade Banana Bread from time to time but it usually has butter and more bananas than this recipe. As I was beating the banana bread it had the light flavor I remember from being a kid. So, this is Banana Bread just like Mom made. Hint: Are you freezing your bananas as they turn brown? My family won’t eat them when they turn brown so I drop them in the freezer skins and all to use at a later date. Take the bananas from the freezer and place them in a bowl to defrost. Pour off the excess moisture from the bowl once the bananas defrost and cut off one end and squeeze out the banana to use in your recipes. That way you are never throwing away bananas that no one will eat! My family actually preferred this version of banana bread to the usual kind I make which tends to have more banana flavor and a heavier, denser loaf. This is a light, fluffy loaf with a decent banana flavor but not overpowering. One loaf lasted us through 2 1/2 breakfasts. Everyone asked for me to make this again. Preheat oven to 350 degrees. Grease a large loaf pan with butter and coat with flour. In a large bowl mash the ripe bananas until only slightly lumpy. Add all the rest of the ingredients to the bowl and stir to wet ingredients. Beat for 1-2 minutes until light in color. Stir in nuts and then pour into loaf pan. Bake 50-60 minutes until golden brown on top and toothpick inserted in the center comes out clean. Allow to sit for about 5 minutes before removing from pan to cooling rack. yes so true, old fashioned cookbooks are wonderful! My daughters look on pinterest all the time! This sounds lovely! Thank you! My favorite cookbook has my grandmother’s hand written recipes in the back for church dinners. I love that! My mom got one from her tiny town from the church and I love it! Old cookbooks are the best! I have several from churches and schools. Everyone submits their best recipes so there are a lot of winners in those old volumes. I think we had Fanny Farmers cookbook. But, I also remember making everything from scratch too. Archived ! I love banana bread and banana muffins and cupcakes. I make them fro scratch too. I don’t know if you’ve made a banana recipe with sour cream or yogurt. It tastes delicious…. Haven’t uses yogurt or sour cream before. Will have to try that now with one of the 10 bananas in my freezer!